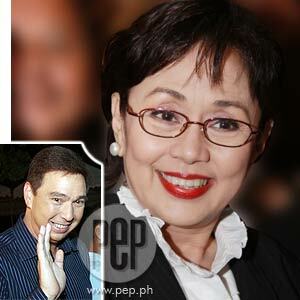 Star For All Seasons and Batangas Governor Vilma Santos managed to find time to join her husband, Secretary Ralph Recto (inset), and their son Christian to watch the Broadway musical Chicago while they were in New York. After 24 days of almost non-stop shooting the movie In My Life in New York, Star for All Seasons Vilma Santos finally found time to enjoy the best that New York has to offer. On May 12, former senator Ralph Recto took his lovely wife and their son Ryan to watch the Broadway musical, Chicago. The following day, Vilma, accompanied by her entourage and by long-time supporter Alan Trambulo, went shopping at Saks Department Store and other designer boutiques on the famed 5th Avenue of Manhattan. She had longed to do this but never got a chance due to the hectic shooting schedule. Two days earlier, on Mother's Day, Luis Manzano surprised his mom with a brand-new I-Phone, loaded with music from the '80s. She was very happy with her gift! Vilma has been teasing her son to buy her an expensive bag similar to the one he bought for his girlfriend Angel Locsin. The New York shoot of Star Cinema's In My Life, in which she stars with Luis and John Lloyd Cruz, wrapped up on May 11. On its last week, several important scenes were shot in the tri-state area of New York, New Jersey, and Connecticut, plus a special side trip to Niagara Falls for the entire staff and crew. After New York, Vilma flew to Los Angeles to spend five days with her family and relatives before returning to Manila.